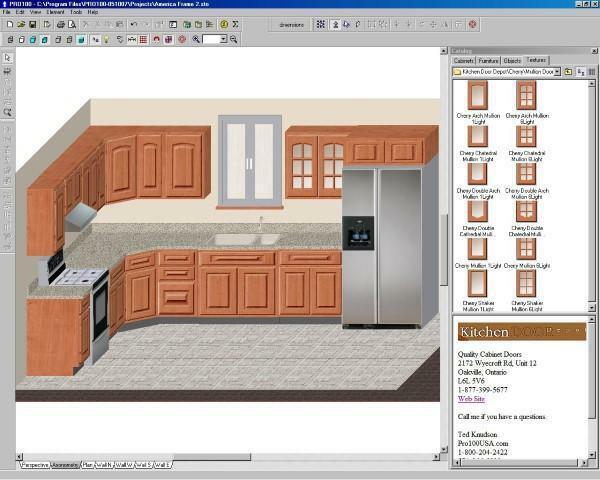 Whether you have a do-it-yourself project or you are a professional, Pro100 is the perfect software for cabinet refacing. 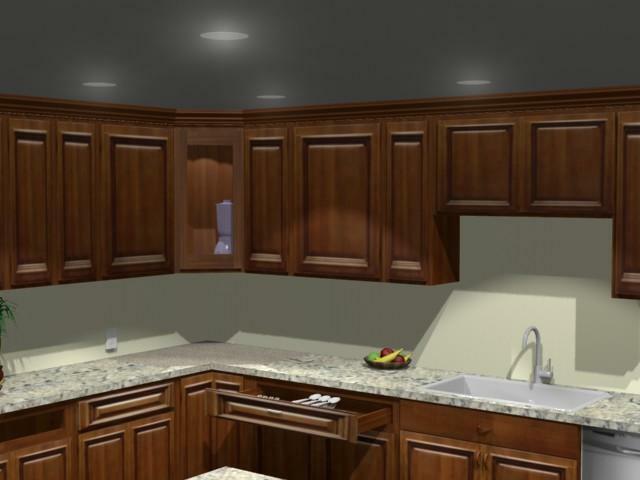 Redoing the kitchen with new cabinets can be very costly. 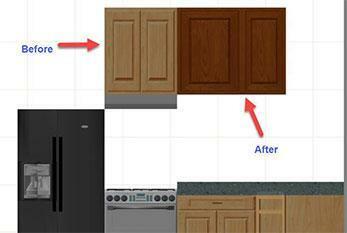 Kitchen cabinet refacing is inexpensive. You will certainly experience lower cost with a higher resale value if that is what you do. You could be a realtor helping a homeowner make the home sell quicker. As a professional, you are probably aware that settling on a simpler and less expensive way is less intrusive solution than doing an overhaul on your entire project. What the kitchen refacer needs is speed and Pro100 has that, you are able to maintain the elegant look by transforming your kitchen from outdated to outstanding with less mess and less hassle. 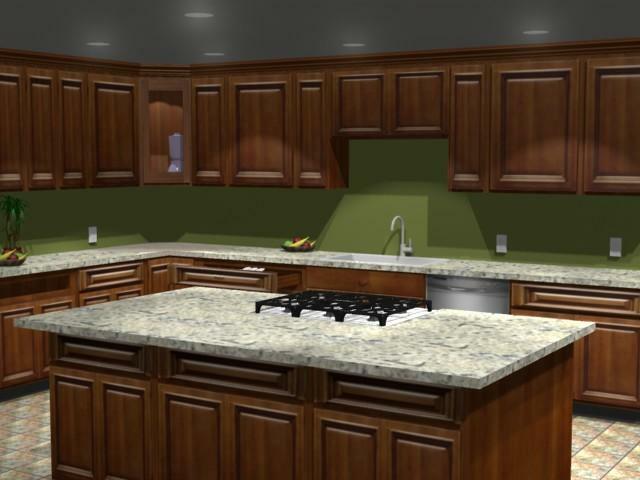 Visualize the wood materials, drawer fronts, handles and the little details. View selection of door styles to create the look. All you have to do is drag and drop. Look at the pictures, all you have to do is drag the door style you want from the catalog on the right and drop on a door and they all change. The doors are jpg's so you can use any manufactures door that you have or can get a picture of. 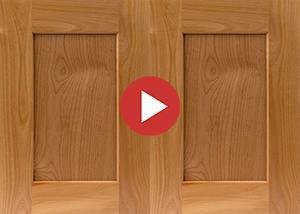 Most of the door manufactures have pictures of their doors on the internet. If you make your own just take a picture and save as a jpg. You can also create kitchen templates so all you have to do is load a template like you see below and start showing different door styles. Whether you are doing a laundry room or kitchen design, you can create a kitchen from scratch if you need to, using our extensive library of cabinets and appliances. Do you make custom cabinets if needed? You can create any cabinet the prospect can dream up. Need a pantry cabinet with a microwave built in? Not a problem for Pro100. Download the demo and try it. If you have a question Call now 574-299-5330. 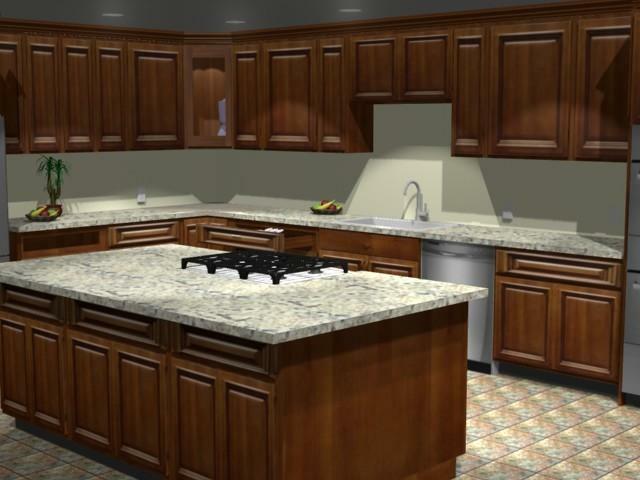 Pro100, 3D Photo Realism Remodeling software will help your potential customers visualize their project. Close more sales by showing your prospect what the finished project will look like. 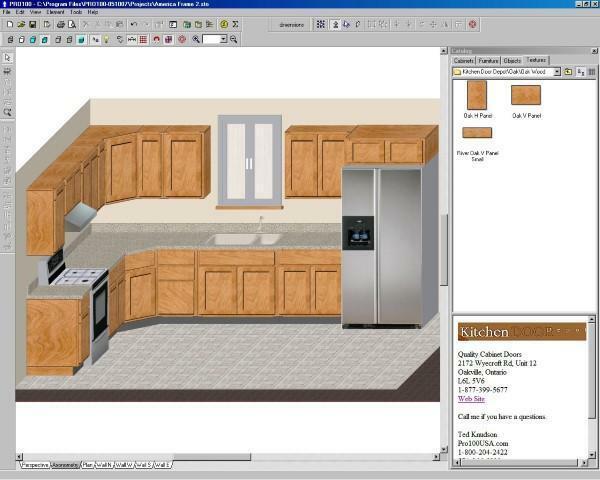 You can quickly and easily design your remodeling job. 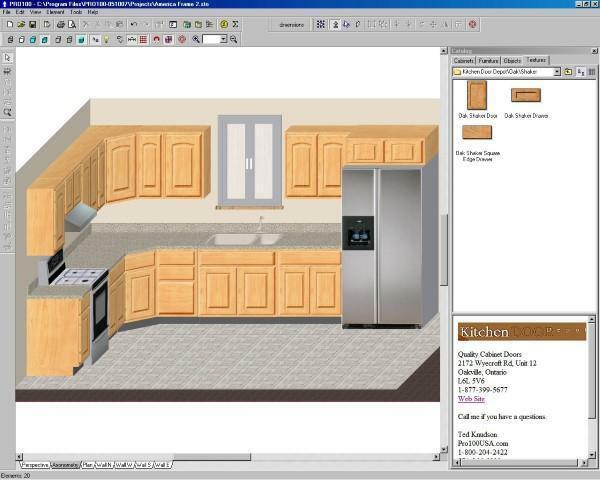 Pro100 will create perfect remodeling plans in minutes. Because of thousands of ready-made objects that you simply drag and drop to create your 3D drawing, floor plans and elevations., it is fas and easy! Design any interior: Design Kitchens, Bathrooms, Office Spaces, Closets, Home Theaters, Family Rooms, Layout Garages and Retail Space, any and all commercial and residential spaces! You get thousands of ready-made objects, furniture, kitchen and bathroom fixtures, lighting fixtures, cabinets, office furniture, plants, closets. electronics and much more! You don't need to be an artist to create great-looking designs. Pro100 helps you align and arrange everything perfectly. You get the power of a CAD program without the CAD hassles or price tag. 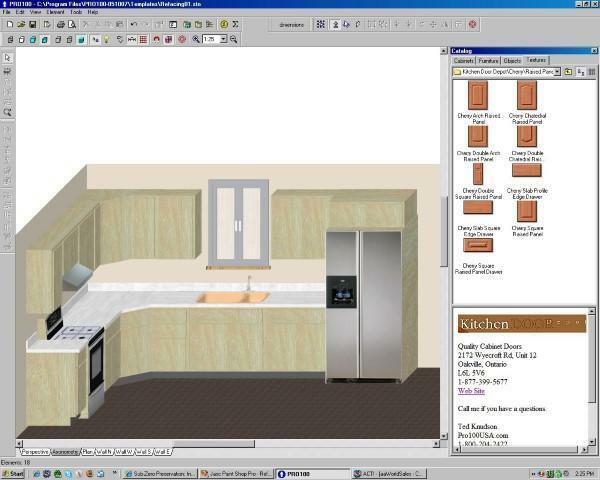 You can create your own objects like cabinets, furniture, entertainment centers or what ever your mind can conceive. You can use any .jpg or .bmp to skin an object. Get pictures of appliances, electronics, flooring, tiles, wall paper from your suppliers or the internet. You can use 3D dwg and dfx that are supplied by your suppliers or you find on the internet like the Kolher fixtures you find on there site. 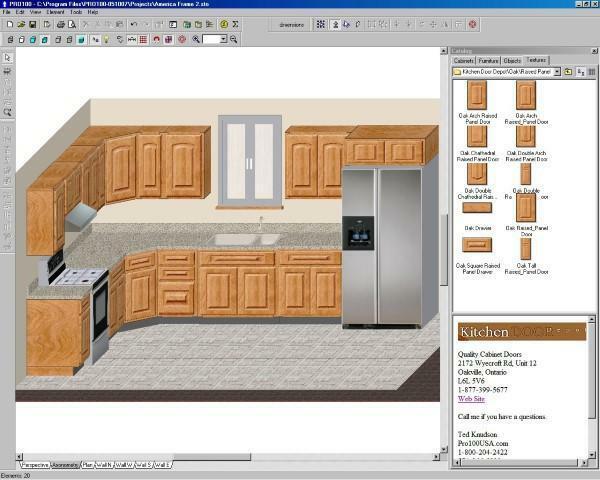 You save time - quickly plan any remodeling job without having to learn difficult architectural or CAD software. Pro100 is so easy to use, download it try it! The ability to create designs with 3D models, change from day to a night view with a single click, add lighting fixtures from the library and create dramatic views. This is not all. 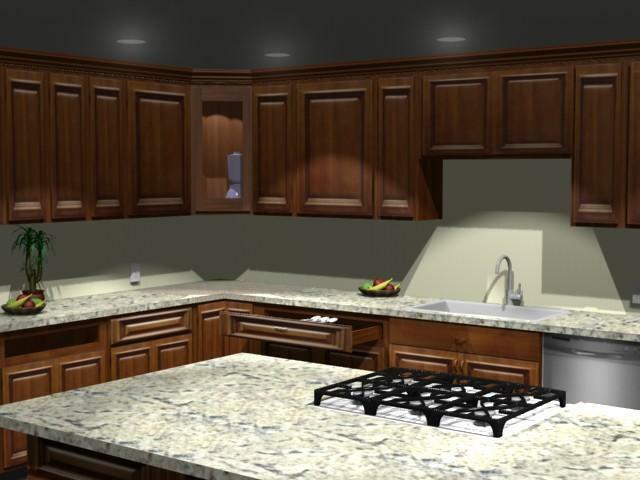 You will be able to visualize your design ideas with your next remodeling project. Pro100 will give you the power to quickly place and arrange walls, windows, doors, cabinets, furniture, and automatically generate a 3D rendering, floor plan, elevations so you can visualize and edit your design - it's easy and it's fun. Save and edit different designs for comparison showings.